This is Mary ‘Melon’ Berry, and she's still searching for her ''Paws'' Hollywood. She is a lovely lady with a personality to match. She hasn't had the easiest start in life, but despite that she loves human companionship, play time and the occasional groom. If you think you and Mary could ‘bake’ a good match, click HERE for more info. Polly's owner sadly had to move into a care home and now she's looking for a new forever home. 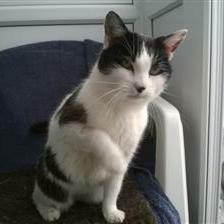 Polly is a friendly, lively and affectionate girl who craves fuss and will put her paw up to pad you for more attention. 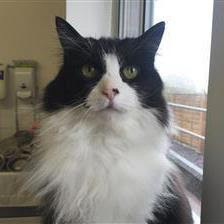 She is a chatty young lady who loves her home comforts, particularly a nice cozy bed, but also enjoys going outside in the sunshine. Interested in Polly? Click HERE to find out more! Mary Berry and Polly are both beautiful, and sound like such great kitties. It makes us especially sad to hear that Mary Berry has had a rough life, and that Polly's human got sick. Purrs and prayers that both find forever homes real soon. We will share. I do wish I could help all the kitties we see! !